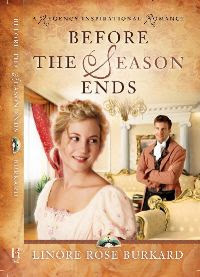 Ms. Burkard knows what makes a true Regency novel so that you’ll no longer be dependent on your local Jane Austen book club. This author portrays everything from the snobbery towards those of ‘shabby gentility’ to those ever-so-important connexions that one needs in that world. It’s an old world, with the speech patterns of that era, and all the foibles that can trip one up and bring ruin so that one may not put one’s face in polite society ever again. Yet I felt the characters—Miss Ariana Forsythe and Mr. Phillip Mornay—to be as alive as my family sitting in my living room. From the moment of their first awkward meeting—her stuck in a tree—to his anger and her embarrassment much later on when she wears too sophisticated a gown for his tastes, you can’t help but long for them to be together. But not too quickly, because their adventures along the perilous road to steadfast love made me smile, and even laugh. I was certainly not the least out of countenance! The conversation in this Regency novel speeds along like an open curricle led by a pair of dappled grays in Hyde Park, so that for a few days I felt as though I lived in that world. Each character’s speech sparkles and scintillates so much, I daresay even Mr. Bennet of Pride and Prejudice would be exceedingly diverted. As for me, I was delighted. It’s been a long time in coming—an author with NEW Regency stories that will entertain and gently affirm us in our Christian faith in a way that Jane Austen would be proud. This is a book you’ll share with your mother, your aunt, your daughter, your best friend.